We already reviewed the garlic knots for this place in a previous entry, however we definitely wanted to come back to try their actual PASTA! What other great opportunity would we take rather than when we visit our alma mater again? And this time, we had some extra taste buds from our friend, Mary. On this bustling Saturday night, the place was crowded in the front because of the take-out/pizza parlor near the entrance. On the other hand, if you’re in the mood for some nice lighting and fancy sit-down dining you can go ahead and speak with the hostess. That’s what we did! 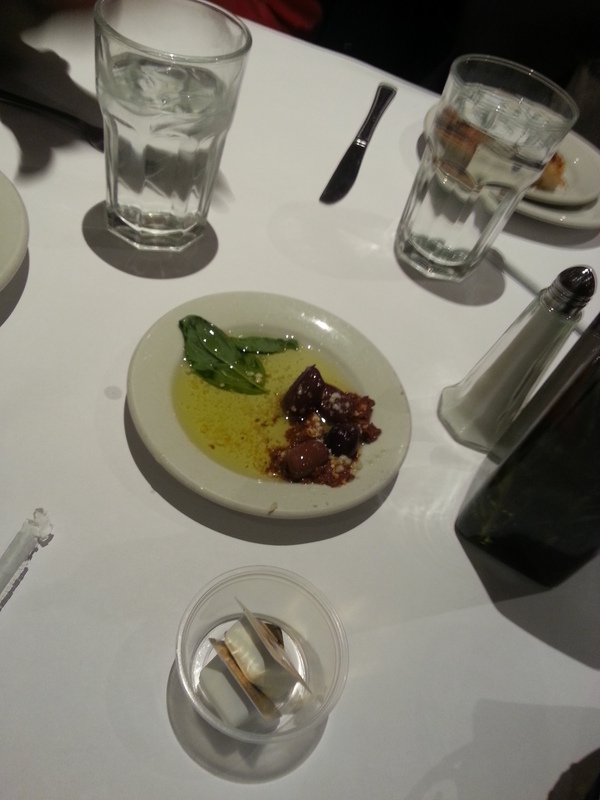 We received some complimentary garlic knots,slices of bread, and bruschetta upon seating, as well as a plate of some good olive oil to dip. 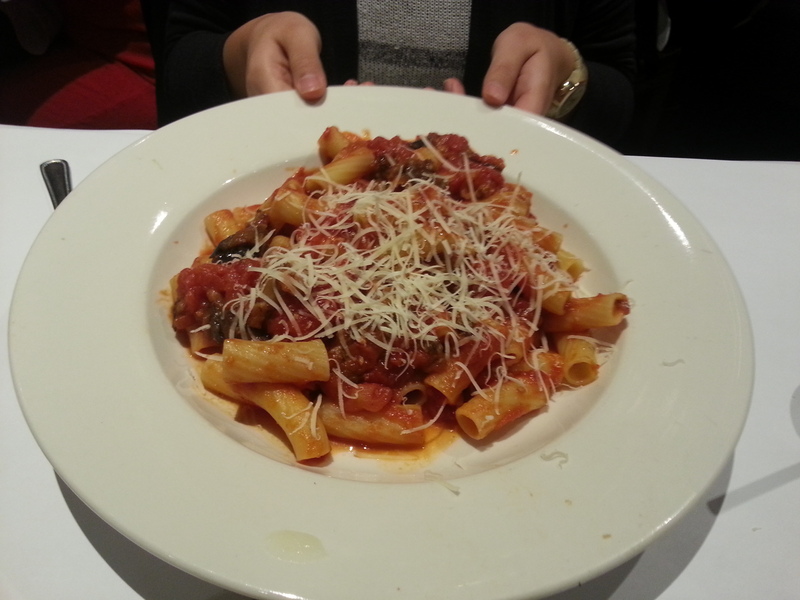 There were many many choices of pasta, so we took a bit of time to decide. Here is the menu for your review. 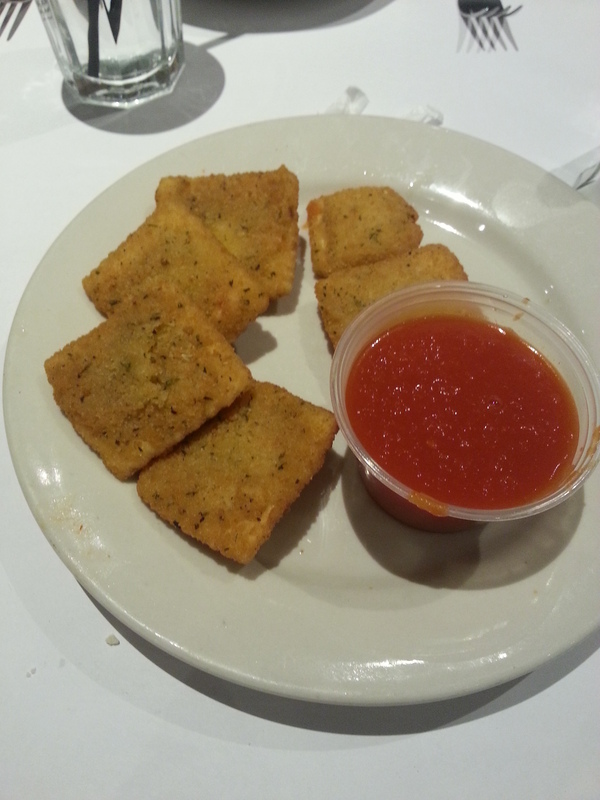 Our first choice was the appetizer Fried Ravioli. Our server was nice enough to be patient with us and gave us some space to decide. Mary ordered the Pasta Siciliana and Vic/I got the Alla Vodka. I definitely recommend this place to who ever loves pasta (like I do). Oftentimes I have these huge pasta cravings and now I wish that I went to O Sole Mio more while I was studying at Stony. Actually, perhaps not because I would say that this place is not that cheap, but the portions are huge. I would probably be more broke than I am now! Great atmosphere and service for a good special occasion meal though. The pasta that I had was really heavy. This is not for the weak! With everything, less is always more because I felt really disgusting near the end and felt like I was drinking heavy cream. 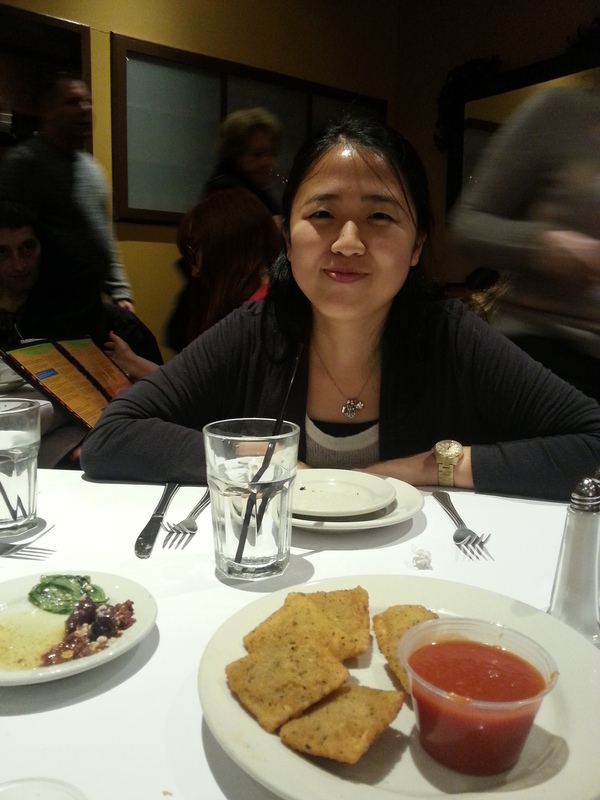 I could barely finish it, even though the waiter split the meal into half for Victor and me. BUT I WILL STILL HAVE IT AGAIN! Mm fat. I tried some of Mary’s pasta and I loved the taste too. The eggplant went really well with the sauce, despite the fact that I am not a big fan of eggplant. The ravioli was just alright though. I’m not sure what else they could have done to it to make it more special, but perhaps it was just because of the regular marinara sauce it was served with. It was pretty pricey for only a couple of pieces. The garlic knots in the beginning of the meal were again delicious, just like the last time we had them! Although this isn’t my first time here, it’s my first time in the restaurant portion of this Italian Restaurant/ Pizza Take-Out. I actually wish I have gone here more too. The food here is just always so good. I just assumed this was mediocre, since it was always advertised around the college we were at. Everything about this place is just wonderful. The pizzas here are like the (good) pizzas in New York City with the thin crust and perfect amount of cheese. The garlic knots, slices of bread, and bruschetta were quite delectable. The fried ravioli was okay, I guess. I don’t know what to really expect. I’ve always heard people rave about fried raviolis, but it didn’t stand out to me. Maybe I’m just not the biggest fan of ricotta cheese. Pinky and I ordered the Alla Vodka and the waiter was kind enough to split our plate into two dishes! I actually really enjoyed this dish and I think I could have finished one whole plate by myself 😛 The sauce was sweet, but it was really heavy and thick for a sauce. The added cheese gave it a more creamy texture. Everything just seemed right about this pasta. Nothing was overcooked and it just went well together. I’d get it again if I came here! I tried Mary’s pasta too! The taste wasn’t quite memorable, but I’m not the biggest fan of eggplant either. So if you’re in the area, come check this place out for their pizzas, pastas, and everything else! 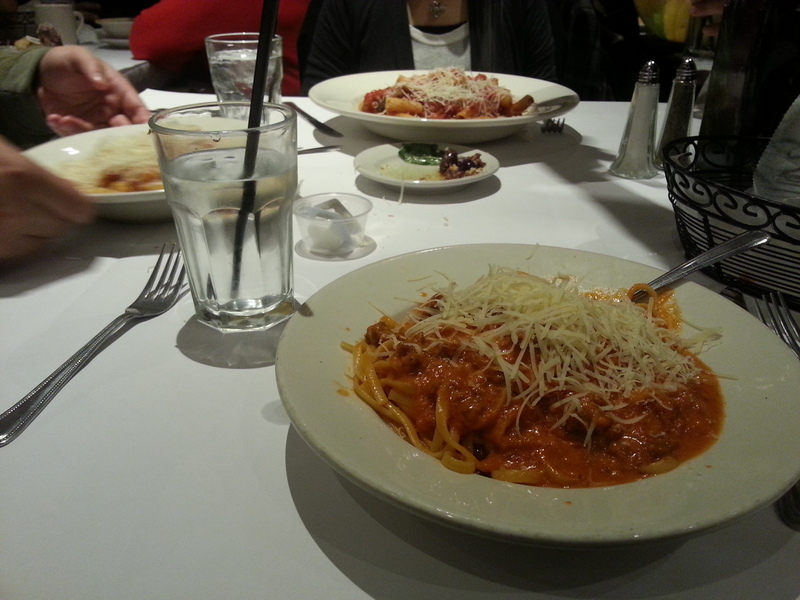 Posted on January 3, 2014 by pinkytwinkieeePosted in long island, New YorkTagged alma mater, college, date idea, date night, delicious, dinner, fancy, filling, food, fried, garlic knots, heavy, italian, long island, lunch, menu, o sole mio, pasta, pizza, ravioli, restaurant, sit-down dining, stony brook, stony brook university.